Preheat oven to 300°F. Prepare a sheet pan with aluminum foil. Set aside. Mince 1 clove of garlic and fresh thyme then blend together with extra virgin coconut oil, salt and freshly ground black pepper to make a paste. Coat the chicken breasts with the paste then roast for one hour on the sheet pan. Allow to cook then remove the bone and slice. While the chicken cooks, cut the cauliflower into pieces and boil or steam until tender; drain well and set aside. 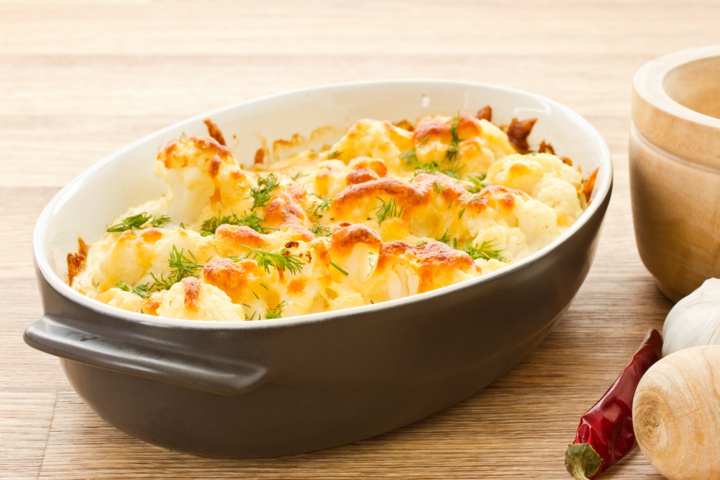 Combine the tomato sauce, 2 minced garlic cloves, mozzarella cheese, chili pepper flakes, the chicken slices and the cauliflower to a baking dish. Bake for 40 minutes uncovered until hot and bubbly.